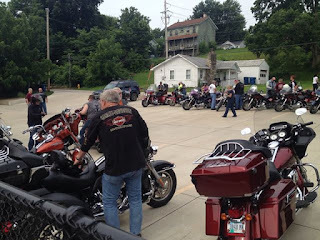 Church Parking Lot- Harley Bikers Every Where! 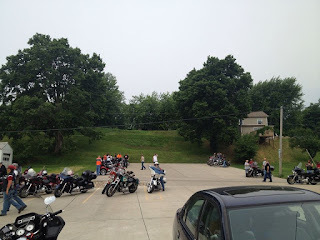 We had just gotten back home from getting the mail and then we had a parade of bikers come park in the church parking lot. (During the week we share the parking lot down town) It was neat to watch them all park and many were waving to my kids. Makes me want to do a Biker Blessing!! :) I counted 47 bikes!! Wowzers! Sadly they were not in town too long because a bad storm was coming and they had to get back to another town.